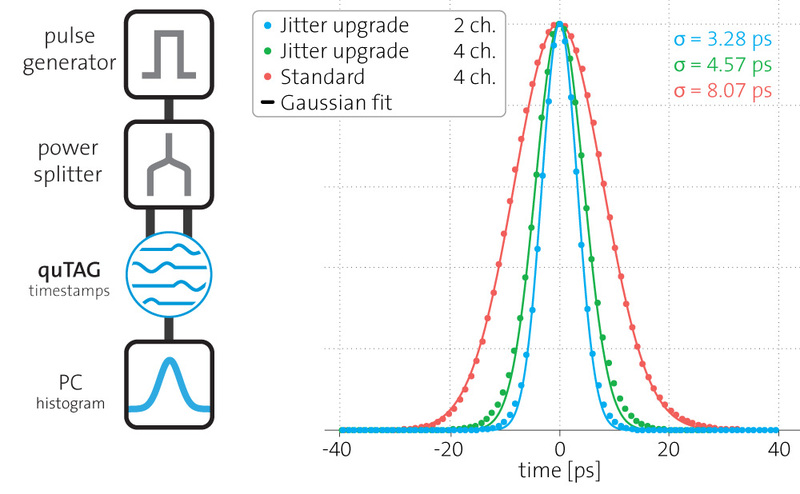 Jitter measurement with two different input channels. 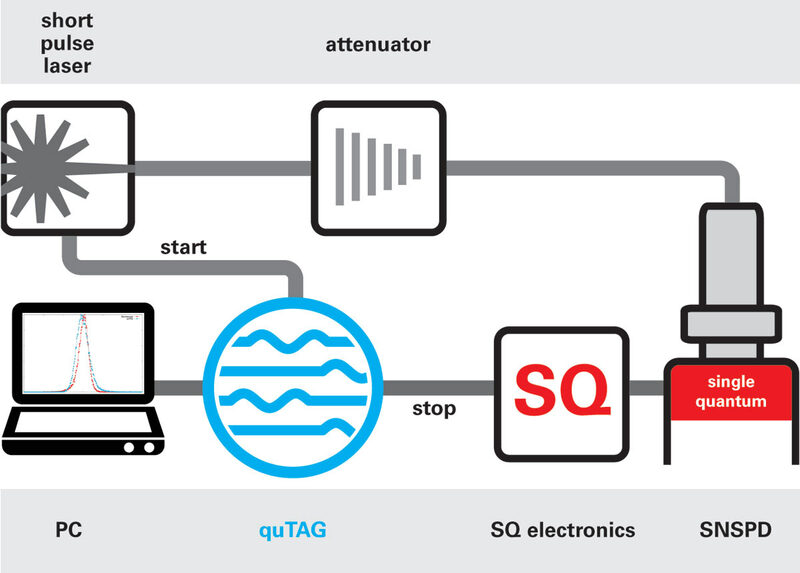 The quTAG is a high-end, easy-to-use time-to-digital converter and time tagging device designed for time correlated single photon counting (TCSPC). It is capable of detecting events with a digital resolution of 1 picosecond and a jitter under 10 ps RMS. Its user-adjustable design registers all signals between -3V up to +3 V, like the widely used LVTTL or NIM. It allows capturing up to 100 million time tags per second and uses a USB3.0 connection to transfer the extensive data. It is delivered with software for Windows and Linux with an easy-to-use graphical user interface. It can also be integrated in custom software. Examples for LabView, C/C++ and Python are included. This model is the entry model for the cost-sensitive customer. It features 1 start and 2 stop channels. The graphical user interface for recording timestamps and the API for your customized solution is included as well. All features of the standard model can be upgraded at your lab. This model features 1 start and 4 stop channels. A separate channel for external clock is available and easily accessible on the front panel. The device allows synchronizing with up to four standard models with all 16 stop channels using the same timebase and clock input. The software includes an analyzing tool for lifetime measurements and correlation functions (e.g. HBT measurements, fluorescence correlation spectroscopy). All specifications can be found in the datasheet. * See the tab “Jitter Measurement” for measurement method. In order to measure the jitter, we generate an electrical pulse with steep edges. This pulse gets split into two by a power splitter and sent into two different inputs of the quTAG (i.e. start and stop-X or stop-X and stop-Y). Then we use the quTAG software to generate a startstop-histogram. We fit a Gaussian function to this histogram and determine RMS and FWHM. The single channel jitter corresponds to σ / √2 from this two-channel measurement, assuming equal Gaussian contributions from both signals. The FWHM can be obtained by the standard deviation with the relation FWHM = 2 √2 ln 2 σ ≈ 2.35 σ. This feature allows lower jitter at < 6.4 ps RMS on all four input channels. 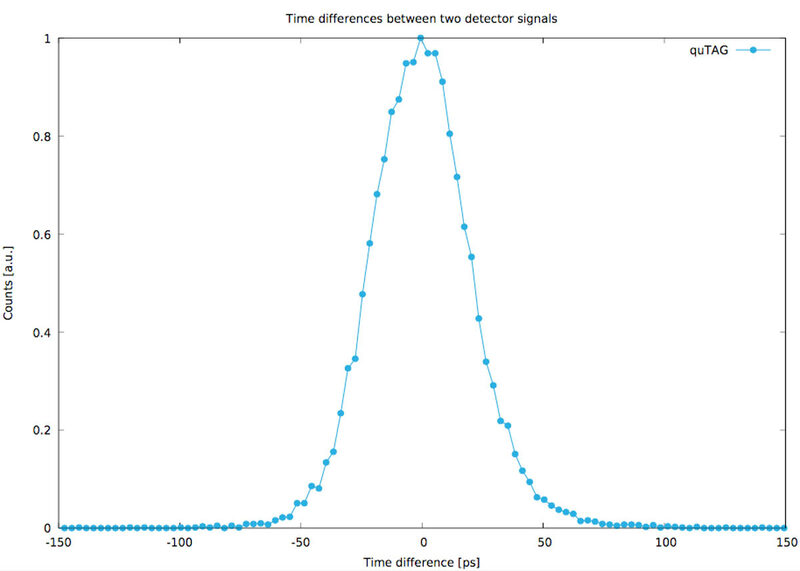 For lowest jitter of < 4.2 ps RMS, two channels can be combined, leaving two stop-channels of one device for measurements. For optimal jitter results, recalibration with external signals might be necessary. The single channel jitter corresponds to σ / √2 from this two-channel measurement, assuming equal Gaussian contributions from both signals. < 4.5 ps RMS/√2 (4 channels). The quTAG basic features two stop channels that can be extended by up to two more flexible stop channels. The quTAG standard has all 4 stop channels enabled by default. This software addon enables the user to analyze lifetime measurements on the fly. It calculates the histograms, fits exponential decreases and takes response function of the system into account. This software extension is intended for calculating the correlation function, as needed for example in Hanbury Brown-Twiss experiments or fluorescence correlation spectroscopy. Standard functions can be fitted to assess the relevant parameters. 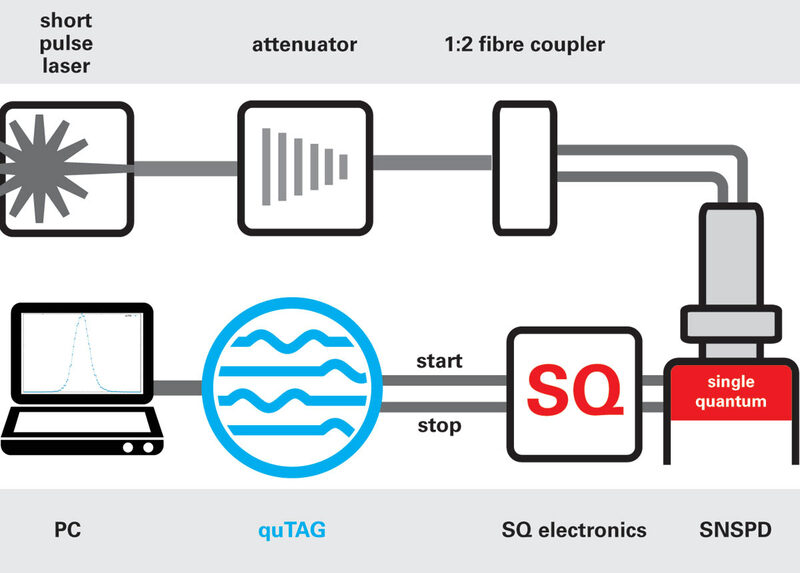 The quTAG can be synchronized to an external clock of 10 MHz to allow more precise long-term accuracy. This extension allows you to synchronize up to 4 quTAG devices. By this, up to 16 equal stop channels are offered and behave like one device – all sharing the same clock input and time base. This extension allows the use of additional input channels with less resolution that can be used for your trigger signals (e.g. pixel clock, line clock). These inputs are included in your timeline and help you sorting and assigning your timestamps. This extension allows you to enable user-defined filters or virtual channels (e.g. coincidence filter or artificial dead time). This filtering happens inside the device so that you save bandwith on your USB connection. Allow to use any frequency between 1-100 MHz as clock input for long-term accuracy. The start channel can be converted to another stop channel allowing the device to have 5 completely equal input channels with 1 ps resolution. This option allows you to enable a divider on all stop channels. This allows higher (periodic) frequencies to be recorded. Additional extensions are available upon request. Customized solutions, e.g. signal outputs, are possible. Contact us for details! We used the quTAG for two experiments together with the superconducting nanowire single photon detector (SNSPD) from our long-time collaborators at Single Quantum. The results proved the efficiency and speed that we expected as we engineered the quTAG. We measured a time difference histogram between the trigger pulse from the laser as start and the SQ detector signal as stop. This is basically the setup for a Fluorescence Lifetime Imaging (FLIM) measurement..
For comparison: Detector response function (red, measured with fast oscilloscope): Timing jitter 14.5 ps RMS, 26.1 ps FWHM. Here, we measured the time difference histogram between one of the two SQ SNSPDs as Start and the other one as Stop pulse. 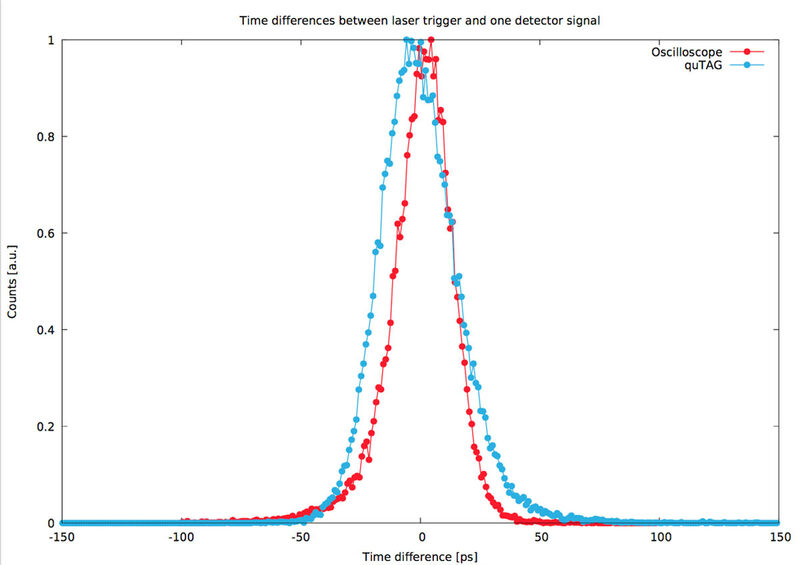 Timing jitter of 2 SQ SNSPDs measured with the quTAG (blue): 21.6 ps RMS, 45.6 ps FWHM. * Note! This software is compatible only with serial number T 01 0012 and newer! Please contact us if you own an older device!